Large bags were a ubiquitous fashion trend in 2007, and the trend for 2008? Bigger bags. Are we just getting used to carrying a ton of stuff? Poor Andy Rooney, who noticed this trend back in November, is going to be apoplectic. According to the Wall Street Journal, doctors say the recommended weight of a handbag should be no more than 1 or 2 pounds. With a wallet, keys, cell phone, camera, lip gloss, gum, notebook and business card holder, it's hard to carry a clutch that weighs less than a pound these days. Add a laptop, some magazines and bottled water and you're lugging a load. But the oversized purses keep coming: Michael Kors' Beverly bag is over 13 inches high and 17 inches wide; the YSL downtown bag is 17 inches high and 11 inches wide. 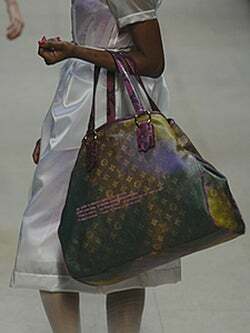 And the Louis Vuitton bag pictured could easily transport a newborn child. Earlier: What's In Your Bag? Does The Average Woman Really Have 21 Handbags?